Collaboration between UK and UofL hopes to raise awareness of the river that gave rise to Louisville. The Ohio River is the reason we’re all here, really. Had it not been for that 25 foot drop in elevation we call the Falls of the Ohio, riverboats could have just sailed right on past the site where our fair city grew up. But instead, they had to stop, portage their gear, and load up again below the walls. And this was born Louisville and Portland. Over the centuries, Louisville has had a mixed experience with the mile-wide river that meanders slowly through. At various times, it’s been the untamed wilds requiring the fearless skill of the ol’ Kaintuck. At others, it was an engineering problem to be solved, eventually being tames with major dams and hydroelectric efforts. For much of the Louisville’s history, it was something to turn your back on and let be an open sewer that carries the city’s waste downstream. But recently, society has been turning all of those notions on their heads: the river is an asset and place of identity and recreation. The city is like a teenager who finally grew up and realized his or her parents are actually kind of cool. We’re returning to the river. Infrastructure, created in collaboration by Jeff Embree (UK Landscape Architecture) and Kelsi Wermuth (UL Hite Art Institute). Enter 36 Miles: Revealing the Ohio. Students from the University of Kentucky Department Of Landscape Architecture and the University of Louisville Hite Art Institute have been working together to study the impact of the river on the local community and now they’ve prepared an exhibition of their work. Poetically named for the length of Ohio River shoreline in Jefferson County, 36 Miles opens tomorrow evening, Friday, April 29, from 5:00 to 8:00p.m. The free exhibition will be on display at the newly opened home of the Louisville Visual Arts Association, 1538 Lyle Street, in Portland. You can RSVP for your free tickets here. Louis R. Johnson, a landscape architect at Gresham Smith & Partners and professor working on the project, said the idea came from a collaboration between noted New York landscape architect Kate Orff (of SCAPE / Landscape Architecture) and photographer Richard Misrach. The duo published the remarkably beautiful book Petrochemical America combining moving environmental photos and environmental data. Power Plant by Jeff Embree, UK Landscape Architecture. 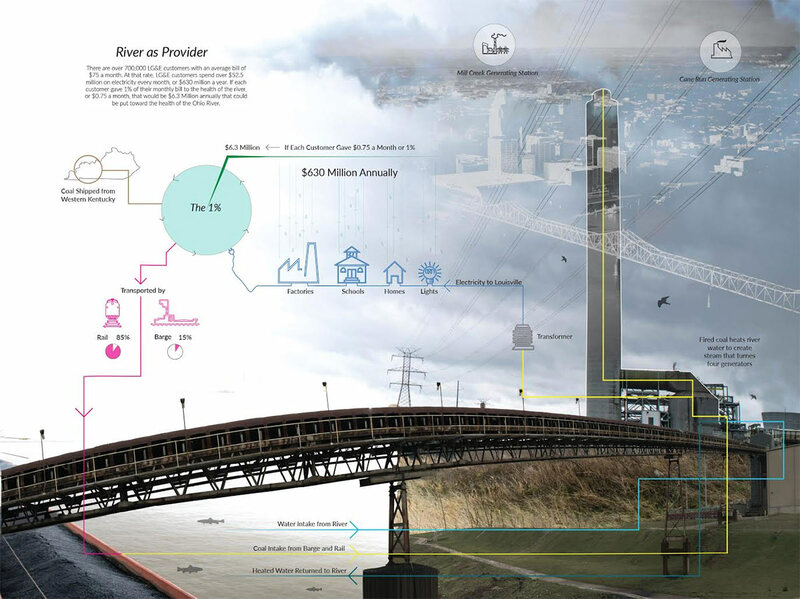 Similarly, landscape architecture students and artists are translating the story of the Ohio River in ways that make its complex story understandable. Johnson pointed to one example where a student overlaid data about a coal power plant in the West End on top of a photo. “It explains why the river is necessary for a coal power plant,” he said. Johnson said it’s crucial for the community to understand the river and what it means to the city. “I came to the realization of how little I actually knew about the river,” Johnson, a Louisville native, said. He said if someone whose profession was tied to the ecologies that rise from the river itself doesn’t have an understanding of the river, then many others in the community likely don’t either. The exhibition focuses on three critical elements: connecting Louisvillians to their river, building environmental public awareness locally, and bringing design education to the city. 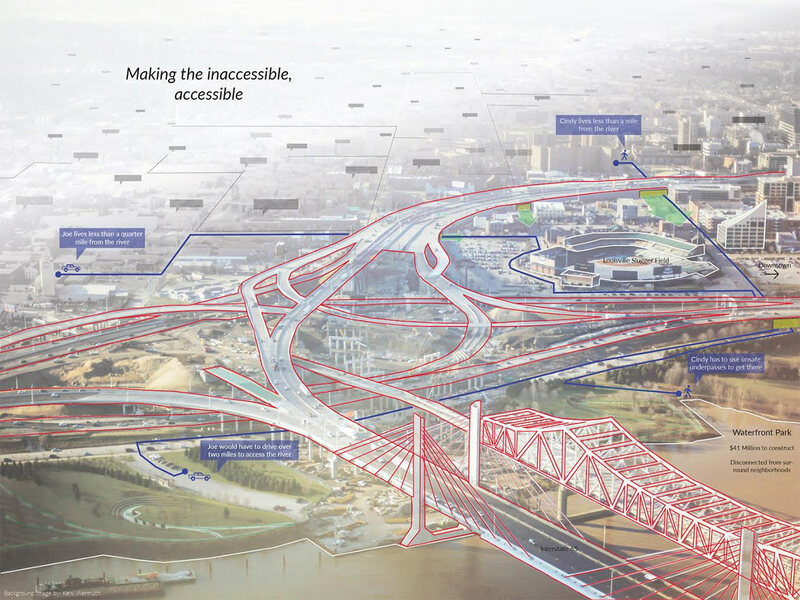 36 Miles is just the beginning, a pilot project that will lead to further study. Mary Carothers, associate professor at the Hite Art Institute plans to expand the curriculum, creating an entire course around the river, and Johnson said UK will be leading additional multidisciplinary design studios on the topic.